The AK4495SEQ is a 32-bit DAC, which corresponds to high-performance, high sound quality digital audio systems such as DVD-Audio and BD. An internal circuit includes newly developed 32-bit digital filters for better sound quality, achieving low distortion characteristics and wide dynamic range. The AK4495SEQ has full differential SCF outputs, removing the need for AC coupling capacitors and increasing performance for systems with excessive clock jitter. The AK4495SEQ accepts up to 768kHz PCM data and 5.6MHz DSD data, ideal for a wide range of applications including Network Audio and SACD. Zero pop/click noise is achieved when switching DSD/PCM mode or shuffling through DSD song file in either DoP/Native DSD mode(tested in foobar) with our new 768K XMOS PCB flashed with our fine tuned ak449x customized firmware. Please notes small pop/click noise still exist when it is used with the 384K BGA XMOS PCB. 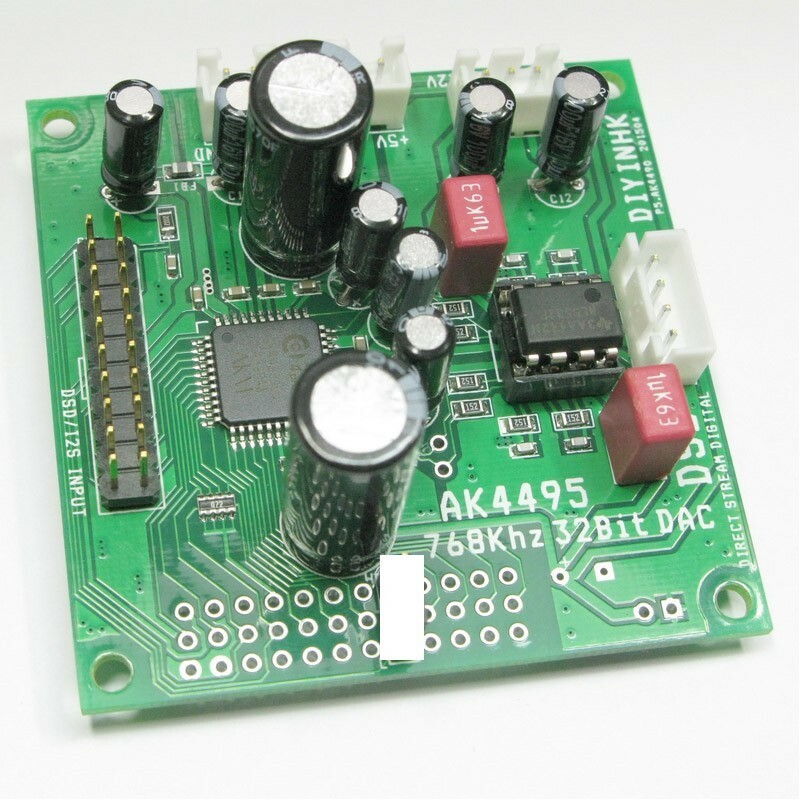 1)The AK4495SEQ PCB can work immediately with only I2S signal and power supply connected, one 3.3V (>300mA), one 5.0V (>100mA) and one +-12V (>100mA) regulated power supply in the default parallel operation mode. 2)For Diyer requires more deeper customization or switch to DSD playback(software I2C command is needed), the latest veraion of AK4495 datasheet is available in the official AKM website. 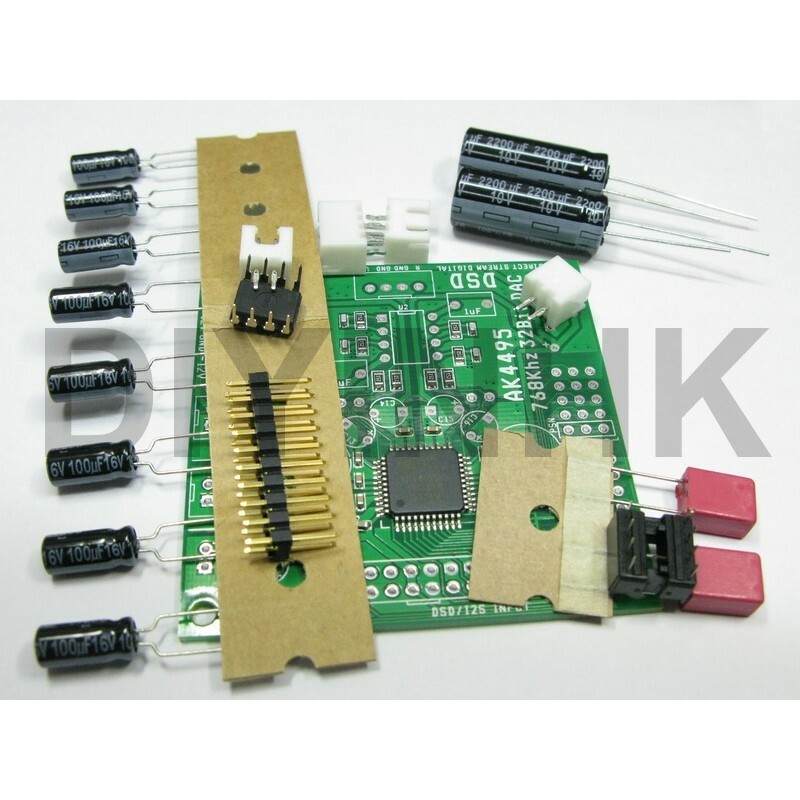 3)The PCB is designed to be DIY friendly. Diyer can cut the trace and uses the socket labelled AVDD_R(5.0V), DVDD(3.3V) for individual power supply to the Left and right analog power supply and digial supply. 1) Install jumper on AK4495 PCB PSN socket and SET it to LOW. The DAC will start to run in software control mode. *According to the AK4495 official datasheet page 41 notes 6 and our test, click noise occurs during power on/off, external mute circuit may be needed if click noise adversely affect system performance.